Acana Small Breed is loaded with free-run chicken and nest-laid eggs from local prairie farms, wild-caught flounder from North Vancouver Island, and sun-ripened fruits and vegetables from Canada's Okanagan Valley - all delivered fresh so they're loaded with goodness and taste. Metabolizable Energy is 3510 kcal/kg (421 kcal per 250ml/120g cup), with 31% from protein, 28% from fruits and vegetables, and 41% from fat. 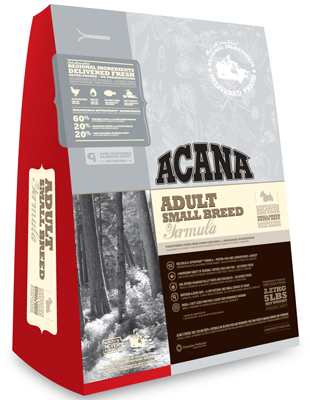 There are currently no questions for Acana Heritage Adult Small Breed - be the first to ask one!